After a heated summer season, you would think that the weather would start to cool down in Fuerteventura in September. But this is totally not the case. September is still quite a hot month here, some will say it's even hotter than August. Or sometimes it feels this way, although actual numbers and statistics don't support this claim. The great thing about coming to Fuerteventura in September is that the sea water has had time to warm up over the summer, so it will be even warmer than in was back in July or August. The first two weeks of September are busier than the last two, since in some countries in Europe school term starts around the date if September 15th, so some families are still enjoying their summer holidays in Fuerteventura. But after the first two weeks the island gets a little more quiet, and if this is what you're looking for (and you are not dependent on school holidays for planning your trip), we would suggest that you wait until that time. It might also prove to be cheaper, in terms of both accommodation and flights, if you decide to book independently. We love coming to Fuerteventura in September, because we love the weather at this certain time of the year. We've also said that September is our favourite month to visit Lanzarote, because the weather between the 2 islands is pretty similar, since they are located so close together. We usually split our holiday into 2 parts: fly to one of the islands, spend some time there, then cross over by ferry to the neighbor island and fly back home from there, after spending some time there as well of course. We do this because we really like the usual September weather in these 2 Canary Islands: it's still hot, but not quite as hot as in August; the ocean water is warmer; there's still almost no chance of rain; the resorts are a bit more quite compared to the summer months. In September we feel like we get the best of everything: great weather which still feels like summer; temperatures still around 30°C during the daytime and better deals, especially when it comes to booking flights. The average high temperature in September in Fuerteventura is around 28°C, while at night you can expect temperatures of around 22°C. The weather will pretty much still feel like summer, since the winds will drop compared to the summer months and it will feel much hotter than the temperatures you see on the thermometers. The highest temperature ever recorded in Fuerteventura in September (at the Airport station) was of 37.9°C and the lowest was of 15°C. The temperatures stay pretty constant between different resorts in Fuerteventura. There can be a slight variation, as well as it can happen to be cloudy in Corralejo and sunny in Morro Jable, but the variations won't be anything major in terms of temperatures. September is still a dry month in Fuerteventura, with hardly any precipitation. But with only 2mm rainfall in September, the chance of rain is actually pretty low. Fuerteventura doesn't see much rain outside of the winter months, and September can still be regarded as summer on the island, given its usual temperatures and its long sunny days. Fuerteventura gets an average of 8 hours of sunshine per day in September, so although it may seem like a big drop compared to the month before, the days are still long, sunny and perfect for sunbathing. Can you swim in Fuerteventura in September? With an average of 22.7°C / 72.9°F, the water is warm and perfect for swimming. With the strong sun during the day, the ocean will be your best option to cool down. A pint of beer or a cocktail might also help (wink, wink). 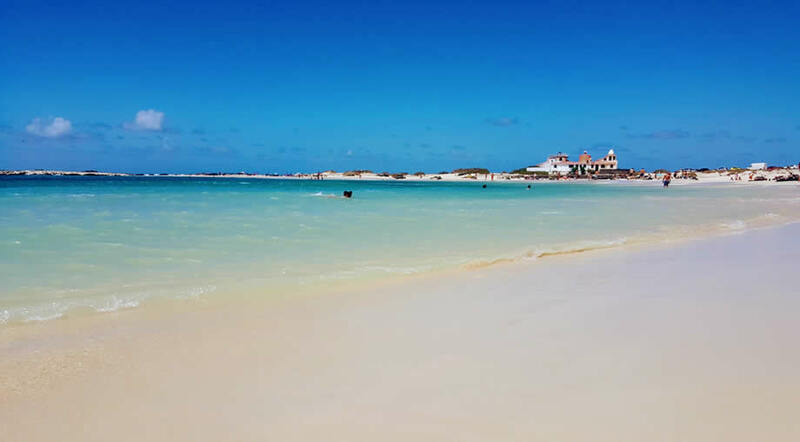 We recommend that you take advantage of the gorgeous weather and explore some of Fuerteventura's best beaches and also some of its most well hidden secrets. Puertito de los Molinos is a wonderful place to visit in Fuerteventura, with a great beach during the summer months and a very relaxed and chilled vibe, with not many tourists around. But not many people know about the caves that stay hidden close to the beach and are only accessible during the low tides (when the low tide is actually low enough to allow for the crossing from the beach to caves). September is probably the best month for trying to cross over to the caves. You can read in more detail about this place in our article about Los Molinos. Our only big advice, which we will also repeat here, is that you need to be really careful if you try to cross over to the caves. Look up the times for the September tides; be there on the beach by the time the low tide starts; don't attempt to cross over when there are big waves or swells; don't try to cross over with children. Visiting these caves is probably the most unique experience you can have in Fuerteventura, but it's nor worth risking your life. The ocean is no joke and you should always put safety first. Located right in the heart of the island, Betancuria is a gorgeous little place that you can visit during a day trip. If you're scared of driving there, you can surely book an excursion with one of the tour companies in the resorts. The atmosphere here is different from the one in the resorts and the trip to get there is an adventure in itself. The Virgen de la Pena is the patron saint of Fuerteventura, so this is an important holiday for the native locals (majoreros). The day of Romeria de la Pena is considered an insular festivity so it's classed as a bank holiday and most businesses are closed (including supermarkets and most shops).